Take the GR30 road to discover the lakes, go mountain biking on the slopes of the Banne d'Ordanche, climb the Via Ferrata du Capuchin, or put on your snowshoes and have a relaxing snack, facing the volcanoes. The Auvergne Volcanic Regional Nature Park is a famous unspoilt destination, particularly appreciated by sports and outdoor enthusiasts. There are numerous circuits enabling you to discover the region, whatever your level. The GR30 road passes in front of the Auberge du Lac de Guéry. 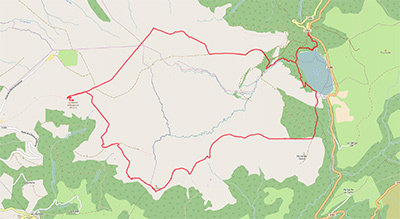 In the heart of the Auvergne Volcanic Regional Nature Park, this 195-kilometer loop covers 12 glacial and volcanic lakes of Auvergne and crosses the Monts-Dore, the Puys, the Artense and the Cézallier. Expect to spend 8 to 10 days to complete a complete loop. The most daring or curious will combine the GR30 with the GR4 and GR441 to cover, in 15 days, the tour of the lakes and volcanoes of Auvergne. 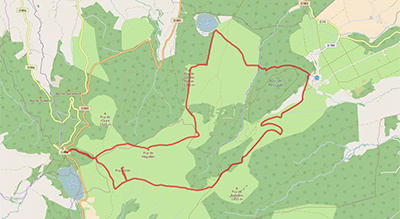 Beautiful hiking loop that provides views of the Puys mountain chain, the Massif Aventif of Sancy - Puy de la Tâche and Puy de l'Angle - between the Col de la Croix Morand and the Col de la Croix Saint-Robert. Between 3 and 4 hours of walking. Superb loop west of Lac de Guéry, on the plateau overlooking Mont-Dore and La Bourboule. Ascent to the Puy Loup, moving on to the milestone of "the four Seigneurs", climbing up to the famous and not to be missed Banne d'Ordanche, to Puy Gros before returning by Lake Guéry. Between 4 and 5 hours of walking. In winter, over 84 km of slopes await you in the resorts of Mont-Dore and Super Besse. In summer, enjoy the many activities offered by these two dynamic resorts: downhill mountain biking, zip lines, discovery circuits, etc. We provide a shuttle service between the Auberge and the resorts of Mont-Dore and Super Besse.